5.1 miles easy / steady – time for chat and catch up. 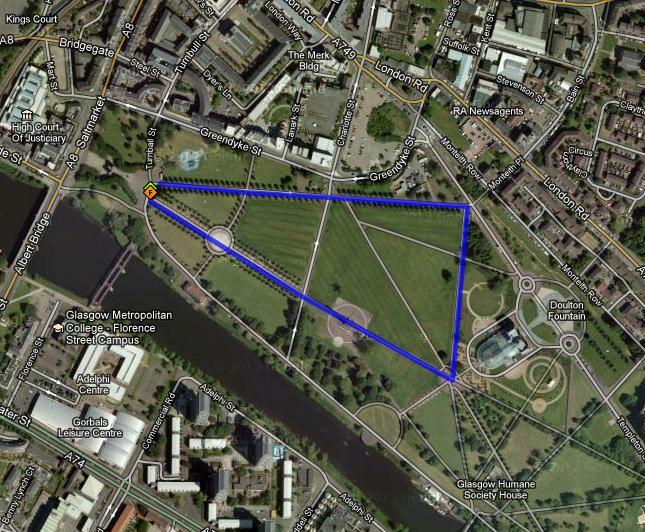 We’re going to run along to Glasgow Green then in and around the Green (3 times) and back. 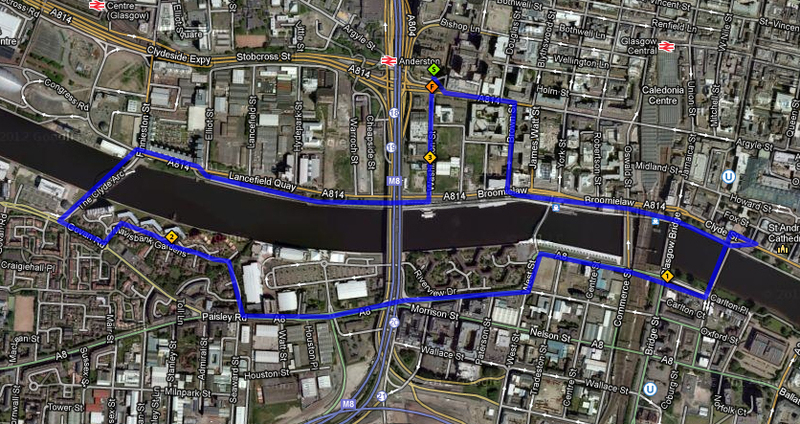 Here’s the route for Sunday 3rd February 2013. Out of the Marriott, acorss the motorway to Argyl Street, Elderslie Street, up to and into Kelivngrove Park, across Kelvin Way, over the road, up and down the hill at the back of Kelvingrove Art Gallery. Out of the park, down past the old Transport Museum, around and down to the cycle path past the new Transport Museum, along the Clyde to the Millenium Bridge. Over the Bridge past the BIP building, through Festival Park, onto Lorne Street, Squinty Bridge, then home along the Clyde side walk way and up Washington Street (Menzies Hotel). 5 miles in total. Along to just before you cross the road into Glasgow Green, along past the court at the Clydeside, West Street, Paisley Road, Mavisbank Gardens, Bells Bridge, then home. 10:30am at the Marriott Hotel Leisure Club (500 Argyle Street, Glasgow, G3 8RR). 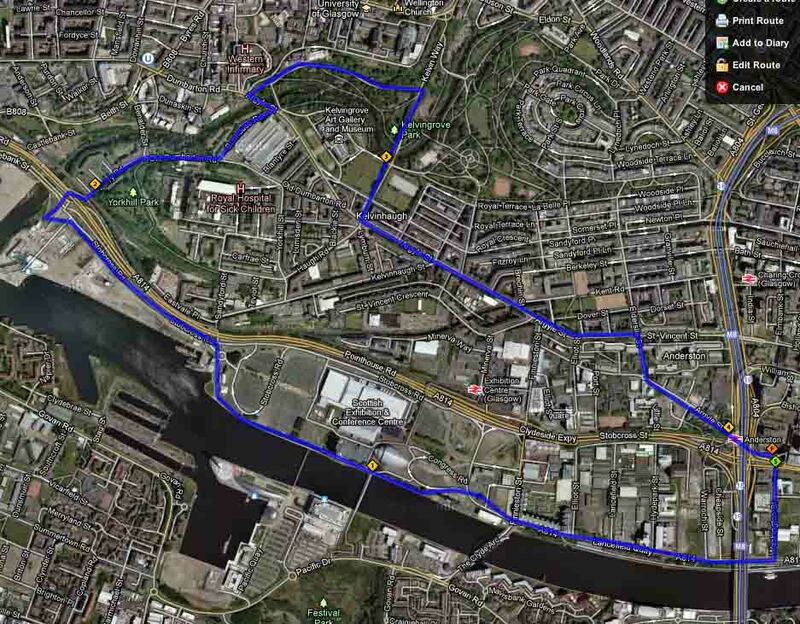 Down to Clydeside, along to new Transport Museum, up to old Transport Museum, onto and across Argyle Street, into Kelvingrove Park, up and over the hill, down Kelvin Way, onto Argyle Street onto St Vincent St, Elderslie St and home past the Two Fat ladies on Argyle Street again. Sunday we start our long run training again, a chance to catch up and build on Tuesdays run by increasing the distance we run. 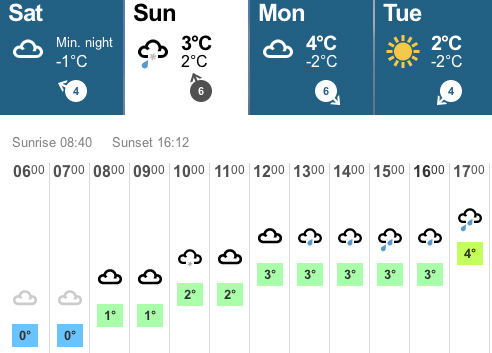 Some of you may have seen the weather for tomorrow – snow is forecast. It will be cold so wrap up warm, but freshly laid snow will be ok to run in. 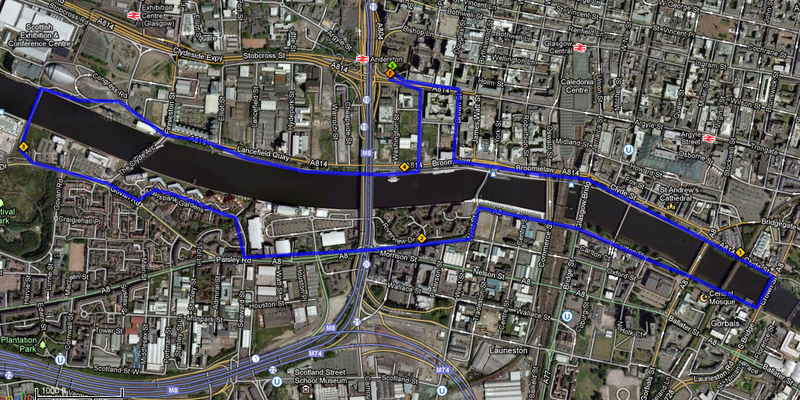 2. a 5k route for those who haven’t been running or want to do a bit shorter tonight). As a one off, Ross will take tonight’s Kaizen Run Club, and it will start at 18:30 instead of the usual 18:15. 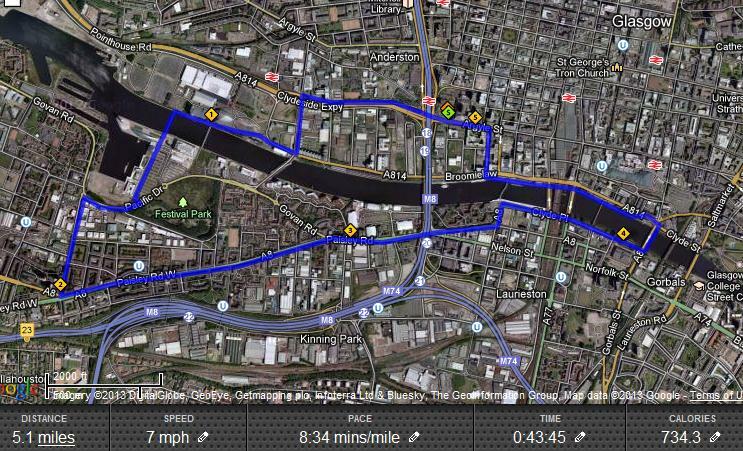 > East along the Clyde until you get to the bridge before Glasgow Green (Crown Street). > Turn right across the bridge, then right in front of the court buildings. > Keep going West along the Clyde front. 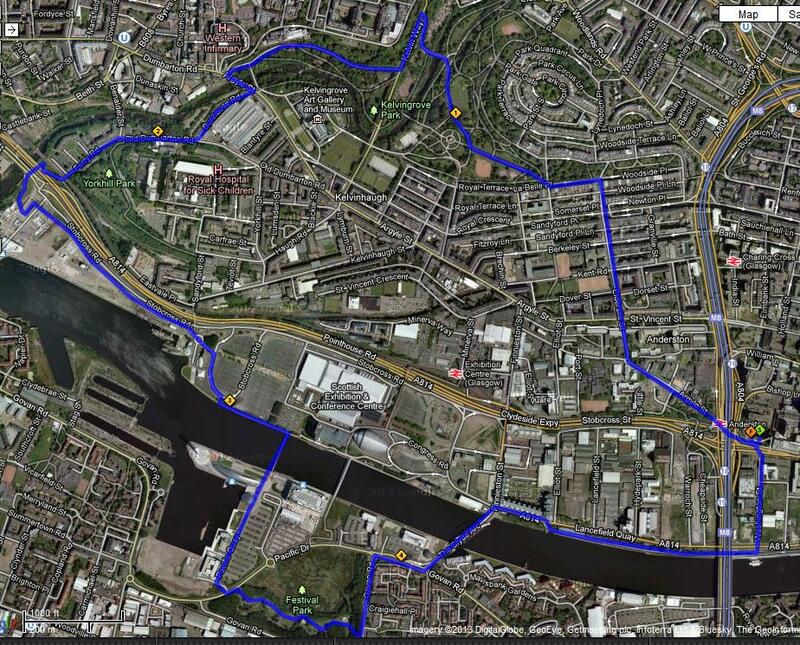 > At the Squigley Bridge, turn left to go onto West Street and right onto Paisley Road. > Then turn right into Mavisbank Gardens. > Right at the roundabout. > Along to cross the Bells Bridge. If you’ve not been running much, we’d still like you to come along, and you can choose to shorten the run by crossing the red and white pedestrian bridge on the way out, and the Squinty (or Squigley Bridge) on the way back.